I’m always hesitant to make judgments about what is in keeping with the “true spirit of St. Francis.” But this story tests my resolve. Francis among the planting containers. Photo© Patricia Appelbaum. What I love about this image – and the situation, the place where I took the picture – is the ambiguous place of Francis in it. Clearly he is important enough for this garden center to want to offer his statue for sale. And the statue is prominently placed: right beside the door where customers enter the shop. But it’s behind the door, slightly obscured. 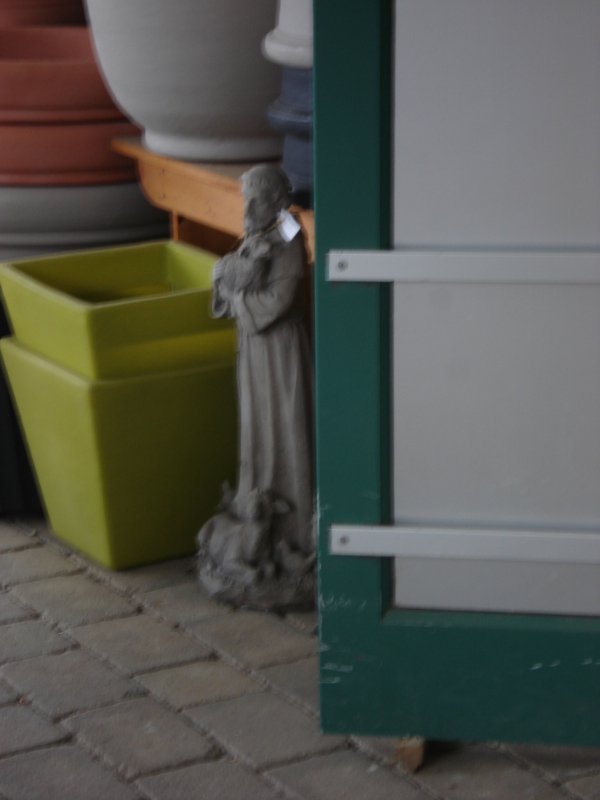 And the figure of Francis is dwarfed by the containers in which customers will build their beautiful arrangements of unusual flowering plants. What does this mean? Does it suggest that Francis is so powerful that he need not be large in size? Or does it say that consumerism and display are more important than saintliness? A wire article from the Pittsburgh Post-Gazette reports on a businessman who bought and renovated a disused Franciscan friary. Originally it was a private home, with some 20 rooms and 13,000 square feet, built in the mid-nineteenth century. The Franciscans bought it in 1935 and left in 2000. The businessman is a graphic designer. He restored or re-created a lot of the period details, and added parking and outdoor landscaping. The indoors now has offices, a couple of conference rooms, a large space for printing and production, a shared kitchen, and in addition, a voice studio where his wife teaches. There’s IKEA, vinyl, original tin ceiling, clean lines and hip colors, digital presses. And what is out front, in a rotunda surrounded by the circular driveway? A statue of St. Francis. This is a building that has nothing explicit to do with religion. The article makes it clear that chapels and confessionals were replaced with contemporary business space. The owner makes no profession of faith, and as far as design is concerned, he’s far more interested in the Victorian heritage of the house than in its Franciscan era. He doesn’t seem to have any particular personal attachment to St. Francis. And yet he feels a need to remember the Franciscan heritage in this way. 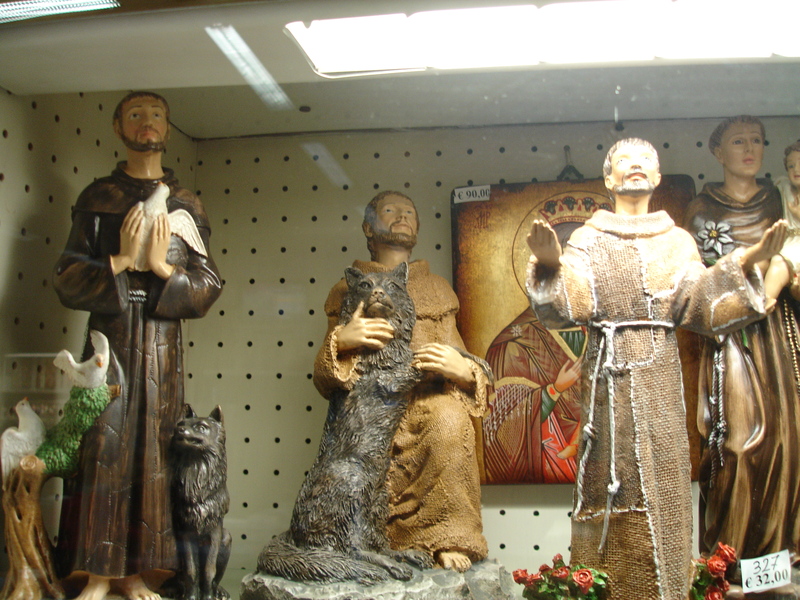 It’s another sign of how everybody likes St. Francis and how his image is universally recognized and understood. One more thing: the article says that the statue was “installed as part of the renovation” – not inherited from the friars. So I would guess that it was the kind of statue you can buy off the shelf, one that emphasizes nature and birds. It’s more of a universal Francis than a specifically Catholic one. May 13, 2015. Gretchen McKay, “Graphic designer, architect give Franciscans’ home in Ben Avon a bold look,” Pittsburgh Post-Gazette, April 4, 2015. Seen through glass in a shop window in Assisi – and seen in several different ways, as he so often is. Seen through a window. Photo © M. Holladay.